One recurrent theme throughout a lot of my recent posts has been the use of questioning. In no small part is this a result of the strand training for which questioning is my group’s focus. Whilst these previous posts have tried to explore various strategies for supporting effective questioning, the purpose of this post is to offer a teaching tool in the truest sense of the word. Good questioning is a multifaceted skill. To name but a few aspects, it involves asking questions at the most opportune moment, probing deeper into responses, finding the ‘Goldilocks’ value in terms of quantity and asking questions for considered purpose. But at the heart of good questioning is asking the right kind of questions in the first place. For this it’s a simple formula: Combine the right kind of interrogative word (who, what, why, when, how etc.) with the right kind of auxiliary verb (is, was might, should, can, will etc.) and you are left with ‘what is…?’, ‘why was…. ?’, ‘how should…?’. Simple. However, the operative phrase in all this is ‘the right kind of’ as the combination of these two elements will determine how superficial or challenging the questions may be. To paraphrase Orwell; ‘All questions are equal, some questions are more equal than others’. The image below of the question frames demonstrates this in all its differentiated glory. That is not to say, those questions, formed at the top left of the frame asking ‘what is…?’, and ‘when was…. ?’ should be resigned to the bin as substandard questions. As I mentioned earlier, good questioning is a multifaceted skill and there is a time and a place for using questioning to check prior understanding. However by moving further towards the bottom right of the grid, we can begin to frame questions that are less prescribed in terms of their outcome and therefore allow for exploration of ideas rather than merely recall. To download copies of this grid, click on the relevant links below. At the start of this post I referred to this as ‘a tool in the truest sense of the word’. 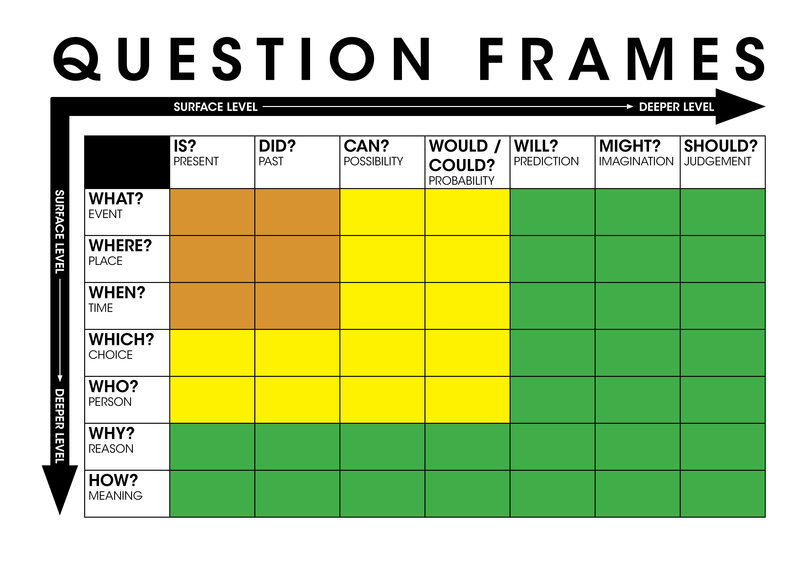 In fact this Question Frame Grid is a multi-purpose tool with a range of applications. Framing questions using a range of combinations from the grid can really enhance the quality of questioning used in classroom discussion, posed by the teacher with either individuals, small groups or whole classes. When you are planning for those key questions as part of a lesson, for which you are looking for written responses, the grid can be used to create the ‘killer question’ which taps at the heart of what you want students to accomplish. I have posted previously about differentiating through offering a staggered series of questions which increase in their complexity (see Differentiation through Tic-Tac-Toe and What Scrabble can teach us about Questioning). The grid offers a useful road-map through questions of increasing levels of speculation. Ensuring that all students have a copy of the grid can be an excellent strategy to scaffold the process of encouraging students to pose their own questions on various topics of study. If you would like instant feedback on your use of questioning in the classroom, ask to be observed and for your observer to use the grid as a tally chart, identifying all of the questions that you asked during the lesson. The result will be a fascinating and (hopefully) useful audit of the questions that you’ve used to motivate learning. Next articleWhere have all the students’ questions gone?